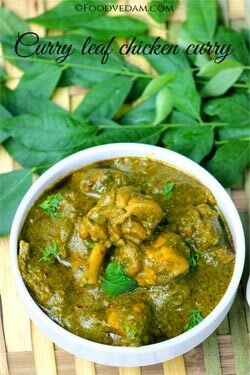 Curry leaf chicken curry with step by step instructions.తెలుగు వెర్షన్. 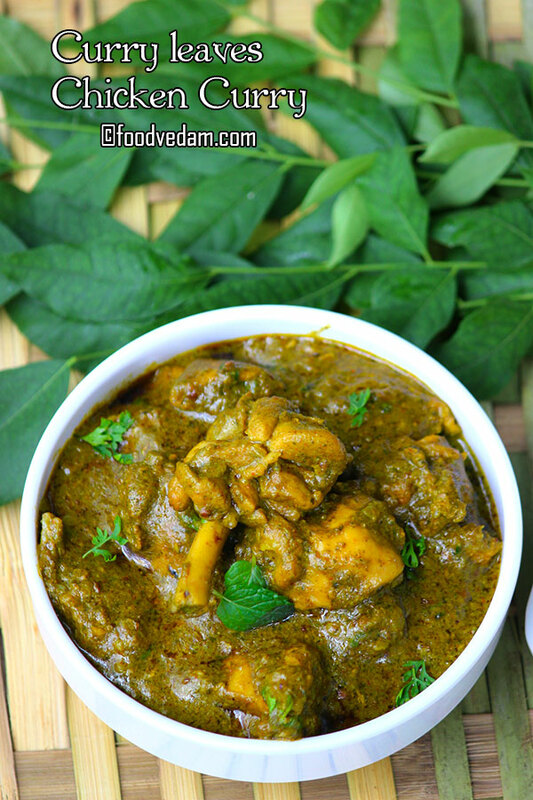 Curry leaf chicken curry is a tasty and spicy Andhra restaurant style recipe with rich gravy. the gravy is prepared with fresh curry leaves sautéed along with cashew nuts, coriander seeds, and coriander leaves and made into a paste. 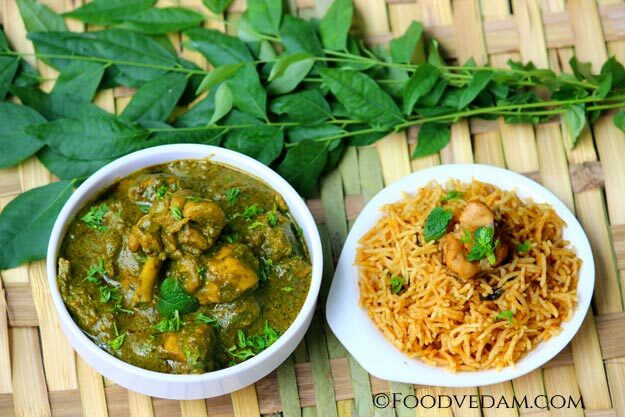 I prepared this curry leaf chicken curry as a side dish for� Konaseema Kodi pulao/Andhra chicken pulao. curry leaves are widely used in Indian cooking as a seasoning ingredient. It has a mild and subtle flavor which enhances the taste of the recipe. it also has many medicinal values. 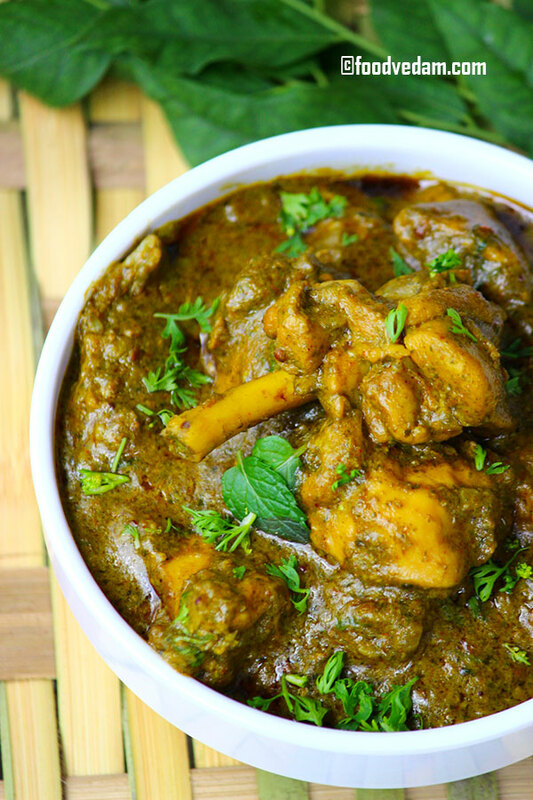 This recipe is mostly found in the restaurant menu in Andhra and Telangana regions. I thought to make this recipe when saw it on a restaurant menu. Googled for the recipe but didn’t find it anywhere on the internet. so wrote the script myself and tried this recipe. it came out really well. my video(of this recipe) was first on Youtube. few people asked me “we cooked this recipe but we didn’t find any curry leaves flavor after cooking”. usually, curry leaves have a subtle taste and flavor when used as a whole leaf. but when you chop the leaves the flavor gets a little pungent and tastes bitter. so to avoid the pungency and bitterness I had to saute them in oil before grinding. this removes the raw strong raw flavor of the leaves and the bitterness. This recipe is usually served with rice. Also tastes too good when served with naans, Rotis or pulkas. I hope you try and enjoy this tasty and delightful recipe. Don’t forget to leave a comment when you try this recipe. take fresh curry leaf sprigs, rinse under running water thoroughly. pick the leaves off and take them into a bowl. heat up the pan, add oil. when the oil is hot, add cashew nuts, coriander seeds and roast them until they turn light golden color. add curry leaves, coriander leaves, green chilies and saute for 2-3 minutes. transfer them to a grinder jar and make into a fine paste adding some water. heat a pan, add cloves, cardamoms, cinnamon, sauté for a minute and make them into a powder. heat oil in a pan, add chopped onions and sauté until soft. add ginger garlic paste and sauté till the raw flavor is gone. add turmeric powder, salt, red chili powder, coriander powder,garam masala and mix well. put the chicken, mix well, cover it and cook for 15-20 minutes on medium heat.mix in between. open the lid after 15 minutes, mix it for once, add coconut milk, curry leaves paste and mix well. add water 250 ml of water to the gravy and cook until the gravy thickens. Hi Ms. Bindu! I made your recipe for KARIVEPAKU KODI KURA for the first time tonight and it was delicious! Because I am lazy I normally rely on spice mixes (Shan, Badshah, MDH, etc.) but I purchased a large quantity of fresh curry leaves (not always easy to find in North Carolina), needed a suitable recipe and found yours. Thanks very much for sharing it! Yum! Hi Craig. Sorry for the mistake. I have updated the recipe. Thank you for correcting me. What can be substituted for cashew nuts for nuts free version of this recepie(kids allergy to all kinds of nuts)? delicious recipe! I tried it for the first time and Was successful. My most of previous attempt to make a chicken curry have been a disaster. Thank you for the recipe…..
Hi, Rekha.Thank you for trying the recipe.i’m very happy that it turned out good :). Yeah.. Superb Bindu garu. I know different methods to cook chicken. But this tastes very good. Really thank you for making this Sunday special to our family members. Interesting result. I will practice it more as I was a bit off with some measurements. Generally nice but felt it was light on chilli hit. Thanks for the receipt.. I tried the same and everyone loved it. Very nice recipe. As you mentioned it has a mild curry leaf taste but is a rich sauce. Next time I’ll try with only half sautéed curry leaves and half raw. Do you think that would be ok or too bitter/raw taste? With the current instant pot craze I made this in the electric cooker with some modifications. Turned out well. Minor note: seems cloves are not listed in the ingredients list as they are mentioned in the recipe description.